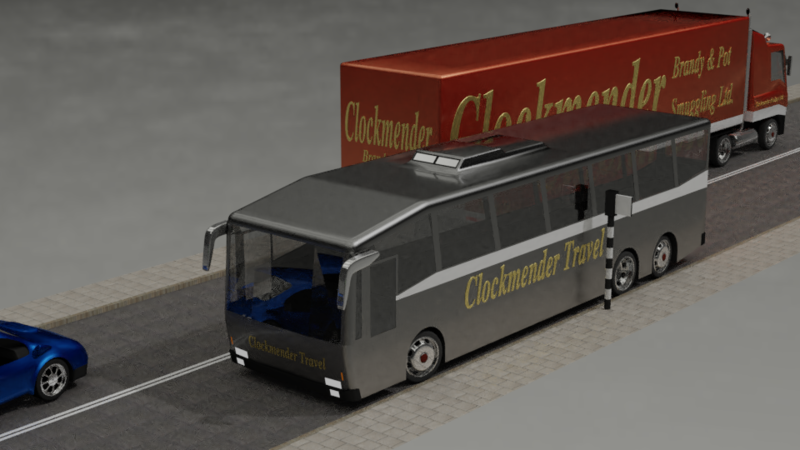 Tutorial-6 Hills & Rear Steer | Clockmender's Blenders & More! Bone rear-axle-tilt which is parented to root inheriting rotation and scale and has a Damped Track constraint to the new target plane target-coach-axle. Bone rrw2-steer which is parented to rear-axle-tilt and inherits rotation and scale and has a driver on its Z axis with the formula -var / 4 with the target rw-f-tgt – Z axis, being the steering bone for the right front wheel. Bone rrw2-steer which is parented to rear-axle-tilt and inherits rotation and scale and has a Driver on its Z axis with the formula -var / 4 with the target lw-f-tgt – Z axis, being the steering bone for the left front wheel. Bone bus which is parented to root, inheriting scale and rotation and has a driver with the formula var with steering-track – X axis as the target. The plane target-coach-axle has the same curve modifier as the other planes and has a driver to keep it the required distance away from the fix plane. This is achieved by adding a driver to the bus bone with the formula var and bone steering-track – X Local axis as the target. So, remember that steering-track is parented to the target plane to steer the wheels using its Z rotation, now its X rotation is used to tilt the vehicle. To steer the back wheels we need to know the ratio of the distance from the main rear axle to the front axle and the distance to the rear steering axle from the main rear axle. Dividing the second of those by the first gives us the ratio; 0.25 in my case, so the rear steering wheels need to turn one quarter of the rotation of the front steering wheel on the same side, since they are one quarter of the distance away, hence why the drivers are -var / 4 in the case of these two steering bones. 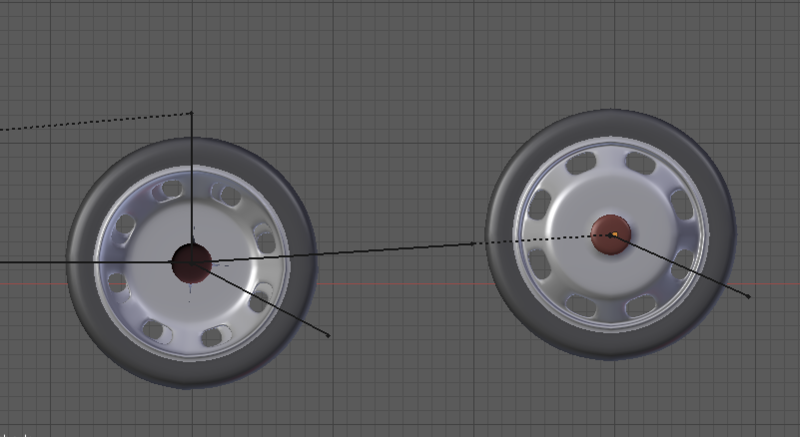 Note the minus sign to turn the wheels in the opposite direction to the front wheels. You should be able to see that the body bone is no longer at right angles to the root bone. 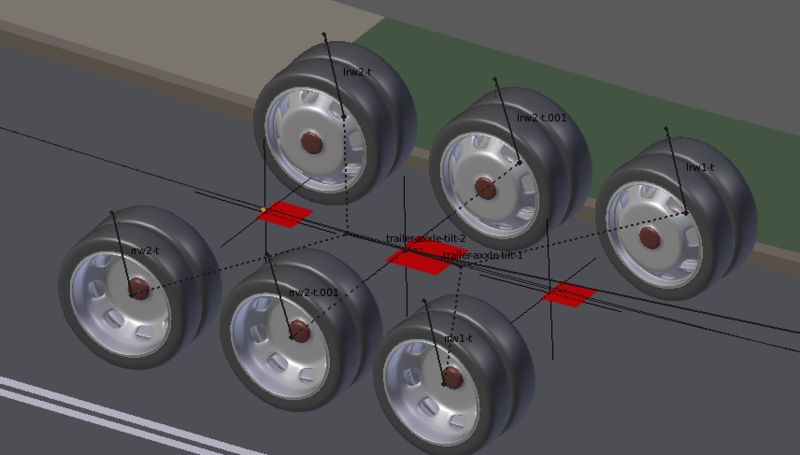 Once on the slope, the root bone is in line with the curve, as is all the targets, so the wheels will once again also be in line and correctly positioned on the road. 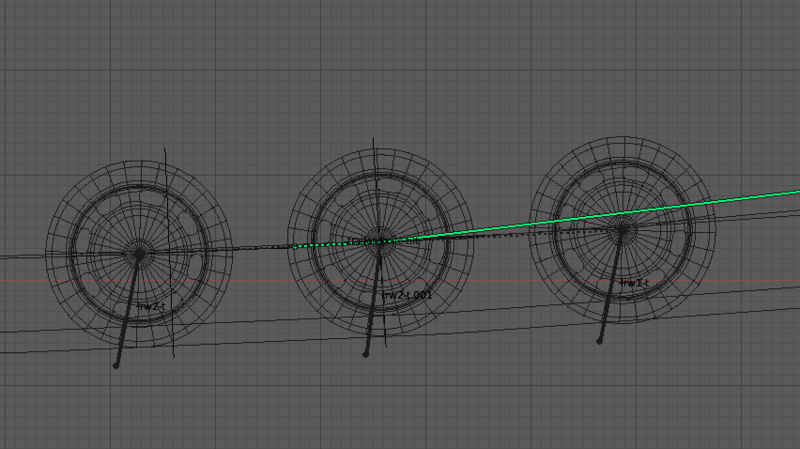 Getting the vehicle path curve to accurately follow a mesh road can be tricky, I tend to put in as few vertices as possible, then scale them to adjust the curve, occasionally sub-dividing two vertices if necessary. 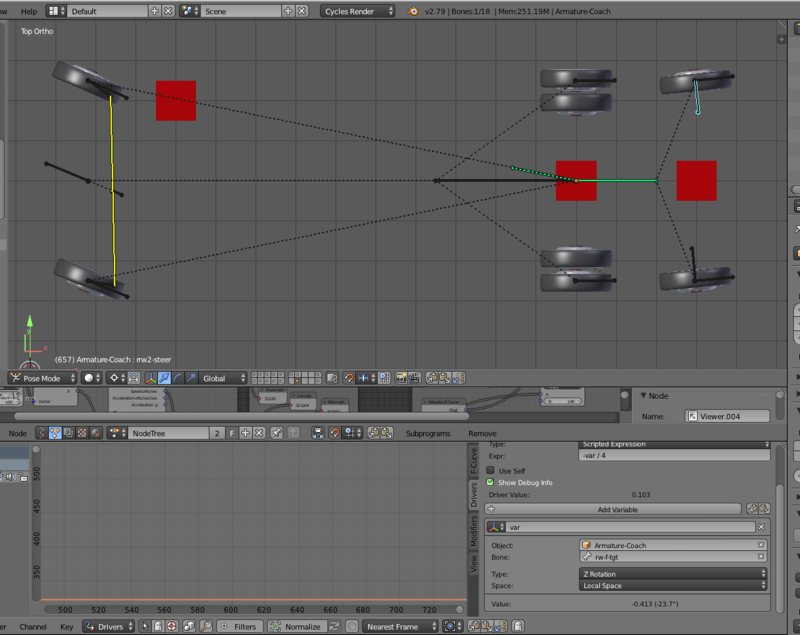 It is trial and error, just keep moving the vehicle and adjusting the curve until it fits. 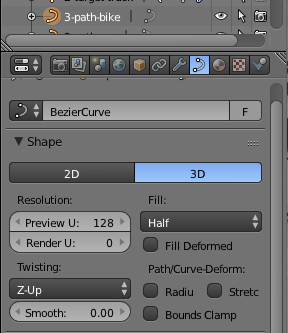 If you use a bevel object for the road profile, with the vehicle path as the curve, you avoid this issue altogether, but there are other drawbacks in that it is difficult to cater for different materials for different sections of the road as seen in the image above. You should be able to see the front wheels and the rear steering wheels have turned a little.